New Site For Green Earth Equities » G.E.A.R. Watch a ScreenCast on the added value G.E.A.R. members enjoy! Watch a ScreenCast on how simple it is to register for G.E.A.R. 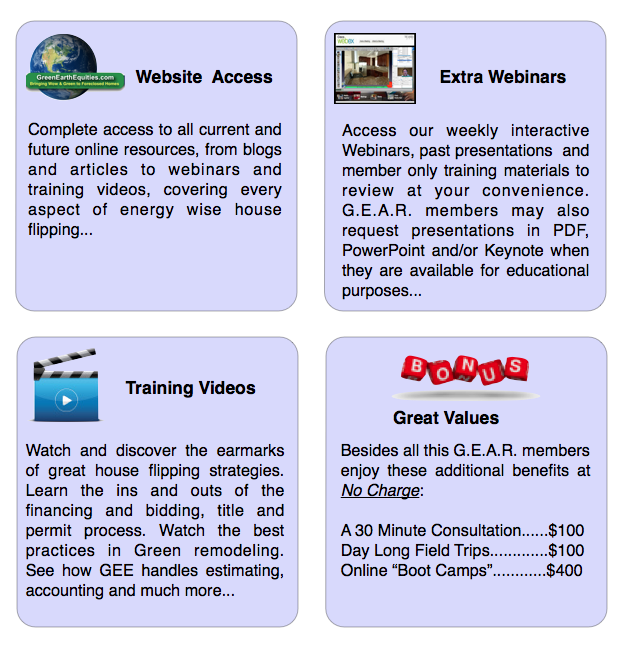 Click Here if your ready to Join an Army of Energy Wise House Flippers. Start Saving the Planet One Foreclosed House at a Time! Take a minute to register for a G.E.A.R. membership to begin taking advantage of all the extra value services GreenEarthEquities offers Renovators, Investors and Buyers.